As I drove to work the other day, I noticed a furry head sticking out of the rear window of the SUV in the adjacent lane. It belonged to a golden retriever, ears and jowls vigorously flapping in the stream of moving air. Her eyes were closed, and her countenance was one of pure joy. Too bad most cats don’t revel in car rides like that happy hound! The average feline would probably be hunched up in his carrier, meowing mournfully, during such an outing. That scenario, along with the effort needed to get the little bugger into his carrier in the first place, makes for an unhappy trip to the vet. It’s one of the many reasons some cat owners unwittingly neglect their little buddy’s medical care. But that’s not the only reason: The strangers, barking dogs, and unusual sounds and scents at a veterinary clinic may stress out even the mellowest kitty. A fearful cat may feel traumatized, may not allow a good exam, and may even pose a danger to the veterinary staff. The recognition of those difficulties got the American Association of Feline Practitioners thinking: What can we do to meet the wide variety of cats’ unique needs and help make feline veterinary visits more pleasant for everybody? To that end, they established a program called the Cat Friendly Practice®. To qualify as a Cat Friendly Practice, a veterinary practice must fulfill eight pages of requirements that include standards for medical care, hospital facilities, and staff education. For us, that meant lots of feline-specific training for the staff. We had many meetings, during which we read and watched hours of videos dealing with cat behavior and handling. We have new practice protocols to benefit our feline patients, starting right after you make an appointment. 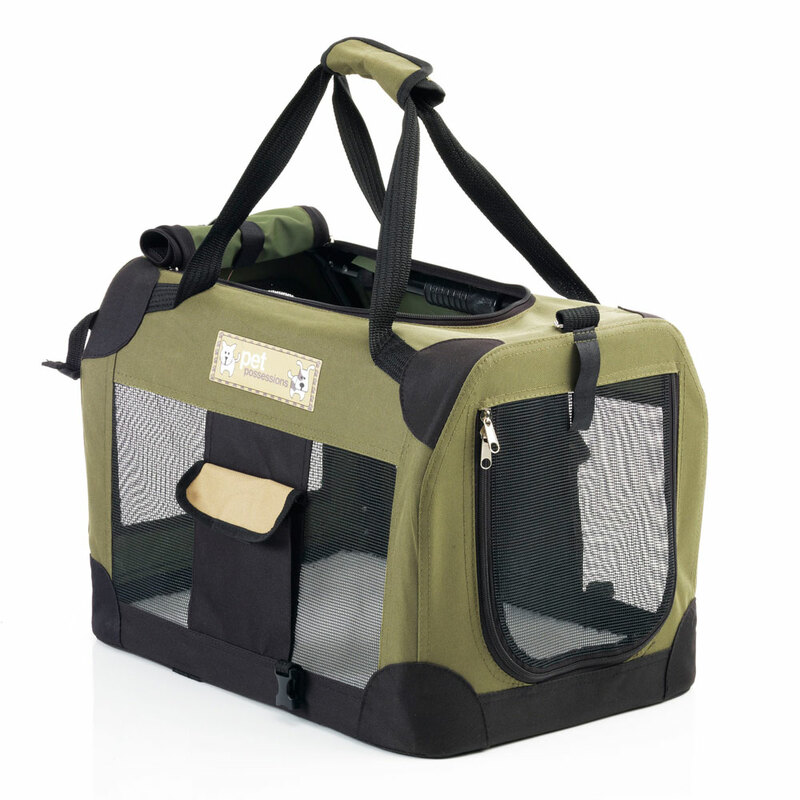 We send you an email with tips on how to acclimate your cat to his carrier. Those that don’t travel well or are fearful during their exam are offered a safe, calming drug. It’s palatable and can be sprinkled on their food before their appointment. We also offer you free Feliway Wipes (which contain a calming pheromone) to use in the carrier before traveling. You now have the option of checking in via cellphone from your car when you arrive at the animal hospital. This is especially helpful if there are dogs in the reception area. If you choose to sit in the waiting room, you can cover your carrier with a towel, which we provide. It’s not always possible, but we try to get our feline patients into an exam room as soon as one is available. 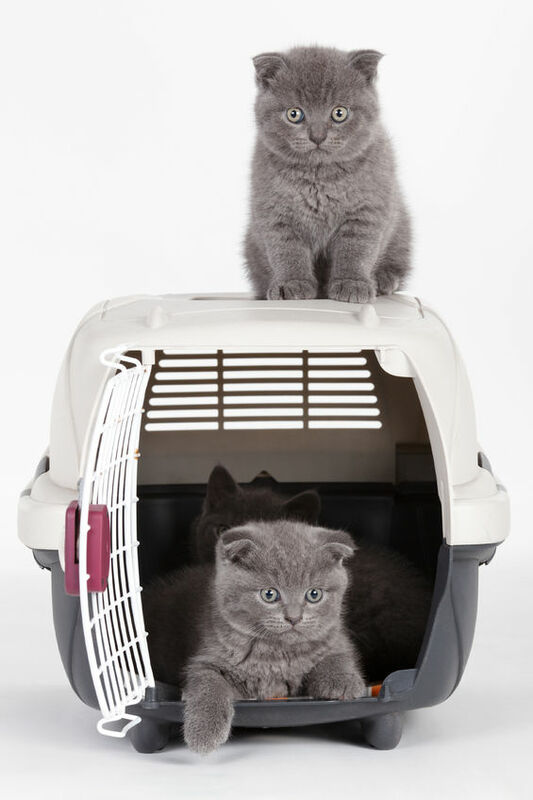 Once in the exam room, cats are encouraged to come out of their carrier and explore a bit, which helps them acclimate. Feliway is soothing, so we spray our clothes with it, and we have plug-in Feliway diffusers in the exam rooms and treatment area. Some cats have no intention of coming out of their carrier. Although it’s sometimes necessary, cats hate being dumped from their carriers, so we avoid it if at all possible. 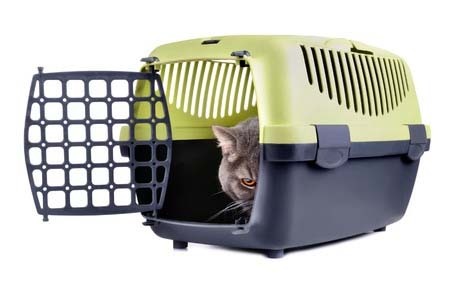 If your cat won’t come out, we can perform the exam right in the carrier. To that end, it’s a good idea to have a carrier with an easily removable top. It’s no surprise to cat owners that kitties hate restraint, so we have some tricks to avoid scruffing our feline patients. Clipnosis, Thundershirts, and towel wrapping techniques are all helpful. If we still can’t do a good exam or perform a needed procedure, we prefer trying another day with an anti-anxiety drug onboard or, in rare cases, using an injectable sedative. Fighting with cats only makes them more fearful at the next appointment. 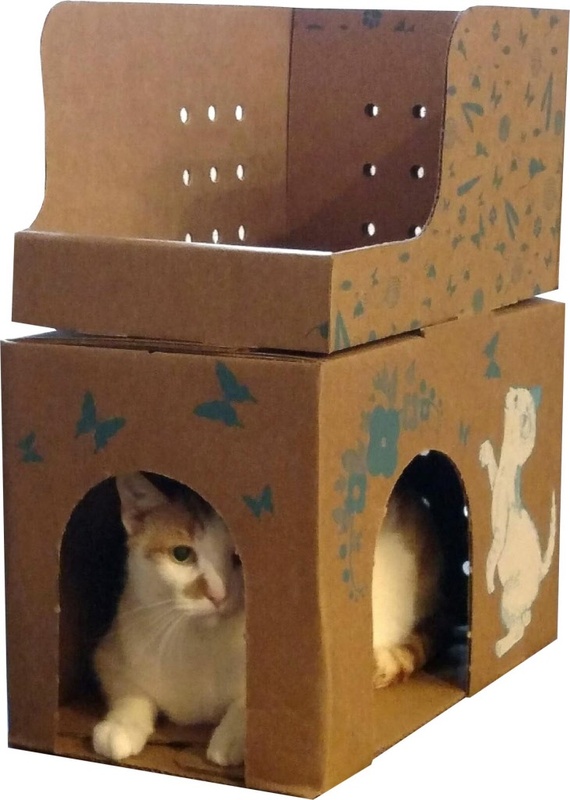 If your cat is hospitalized, we keep dogs and other cats out of his sight and provide a safe haven for him: a special box for hiding. We’re happy to place a bed, toy, or piece of clothing from home in his cage with him, if you think it will make him feel more relaxed. There’s a dictum from veterinary school I’ll never forget: Cats are not small dogs! They are arcane, unique critters that need handling in a gentle, empathetic manner. You can’t schmooze ’em with Pup-Peronis. And their diseases differ from those of our canine patients. Your cat may never come to love the car ride and his veterinary visit, but through the Cat Friendly Program, we’re doing our best to make his experience a better one. For me, summer evokes memories of the carefree days of camp: paddling canoes, diving off a dock into invigorating lake water, telling scary stories around a campfire while enjoying the gooey sweetness of s’mores, hiking, and pillow fights. Too bad those aren’t my fond memories, but rather those of my two sisters! I had separation anxiety and chose to stay home. My parents (wisely, I think) didn’t force me to go, but I imagine that if I’d had the grit to stick out the first couple of days, my homesickness would have transformed into bliss. 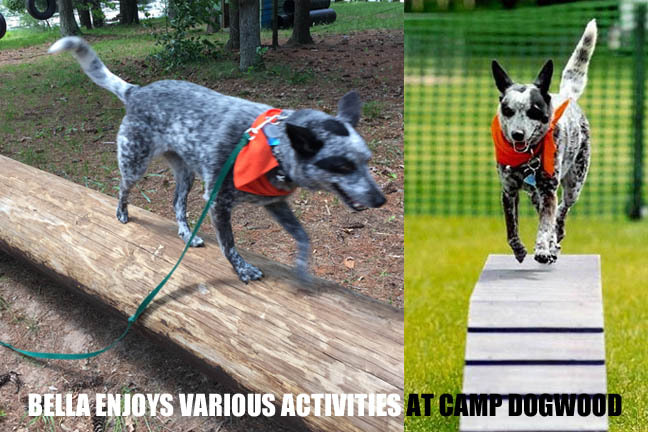 Who knew that your four-legged friend can experience the same delights of camp that you did? I didn’t, until Janet Foreman, a longtime client and ardent dog lover, enlightened me. She and her 7-year-old blue heeler, Bella, are regular fixtures at Camp Dogwood in Lake Dellon, Wisconsin. It’s located in the Wisconsin Dells at the Perlstein Resort and Conference Center at Camp Chi, about 175 miles north of our area. Accommodations for a dog-centric three-day weekend range from tent and RV camping to staying in a lodge or a cabin. Campers can also make their own arrangements to stay offsite. Your dog shares your sleeping quarters, of course. Treiiball: Sometimes called “urban herding.” Dogs use their nose and shoulders to drive an exercise ball into a pen. 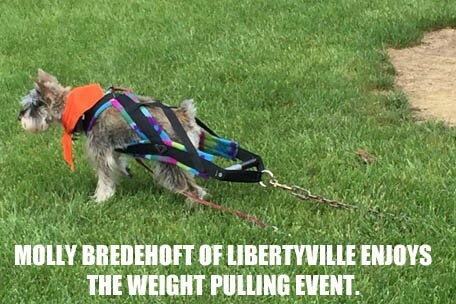 Weight pull: Dogs haul a cart or sled while wearing a padded harness. The goal is to see how much weight they are willing to pull for 16 feet. Barn hunt: This test of a dog’s nose and hunting skills requires her to find a plastic container hidden among bales of straw. It contains a live rat. Don’t worry; no harm comes to the rodent. 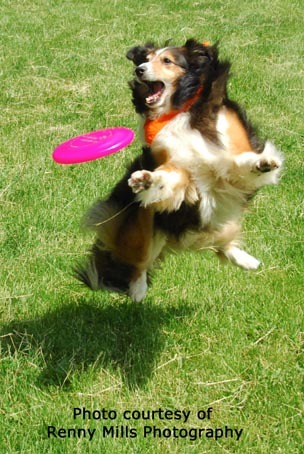 Flyball: If your dog pesters you to throw balls for her to chase, she’ll love this activity. She’ll learn to jump over hurdles leading to a spring-loaded box, release the ball, and race back to you, ball in mouth. No need to worry if you and your dog have never participated in activities such as freestyle dancing, agility, lure coursing, or tracking; the camp has sessions geared toward first-timers. Janet explained that veteran campers give their dogs some downtime between activities, especially if it’s hot. That’s why the camp offers presentations and non-sport activities geared to the dog owner, such as classes on grooming, training, and treat-making. Want to do something useful with those brushes full of hair you get when you groom your dog? You can learn to spin yarn out of it! Camping with your buddy doesn’t come cheap, but the cost seems reasonable for all you get. A cabin for one person and his dog is $635, which includes three nights of lodging, meals, and most activities. Rooms in the lodge cost a bit more. There are also day passes available for those who just want to try a day or two of camp. Many of my clients look forward to their vacations but don’t relish the thought of their dog languishing in a boarding facility. Maybe it’s time to take an extra trip and go somewhere tailored to your furry family member. Then you can both enjoy the classic summer camp experience you remember from your childhood. Photos courtesy of Janet Foreman and Renny Mills Photography. We're getting close to many pet owners' least favorite time of the year: fireworks and thunderstorm season. 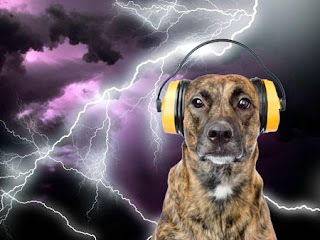 Around the Fourth of July and Labor Day, and during inclement weather with violent thunderstorms, we veterinarians know to expect an exponential increase in phone calls about noise anxiety1. Last year, I wrote a post on this subject in which I discussed methods of masking the noise and soothing your dog. I provided some techniques to desensitize your buddy to noise and use counter-conditioning to distract him. I also mentioned drugs, something pet owners with seriously noise-averse dogs are usually willing to try. But many of our canine friends suffer without the benefit of anti-anxiety drugs because their people don’t like the side effects. When their pooch can hardly get up from the floor, staggers around the house as if he’s tipsy, or sleeps for an uncharacteristically long time, guilt ensues: Yikes, I’ve intoxicated my dog! In fact, excess sedation often merely calls for a dose adjustment, but pet owners usually don’t give the drug a second chance. What if there were a drug that calmed the jitters without causing drowsiness? I seldom promote a new drug that I have little experience using, but the recent launch of Sileo (from Zoetis) is worth a mention. Norepinephrine is a chemical in the brain that is involved with the development of fear and anxiety. Sileo (dexmedetomidine) is highly selective in blocking the release of norepinephrine, thus mitigating dogs’ (specifically noise-induced) angst. It’s actually not a new drug; we’ve been using the injectable form of dexmedetomidine for years as a sedative, and it has a good history of safety. What makes Sileo unique is the new delivery system: Applied to the gums, the drug calms without sedating ─ a real boon. Sileo is an oral gel dispensed in an easy-to-use multiple-dose syringe. (Don’t worry; there is no needle!) Because it’s efficiently absorbed through our skin, gloves should be worn while administering Sileo. Dosing is easy: The syringe is placed between the dog’s gums and cheek, and the plunger is pressed to dispense the product. It works by absorption via the mucous membrane in your dog’s mouth and shouldn’t be swallowed, which renders it ineffective. Therefore, neither food nor water should be offered for 15 minutes after treatment. If you anticipate an anxiety-producing noise event, apply the Sileo 30 to 60 minutes beforehand. When an unexpected event occurs, just give the drug as soon as possible. It could take up to an hour to be effective, but that’s true of all the drugs used for this purpose (and some take even longer). You can administer up to five doses in one day, as long as the doses are at least two hours apart. Sileo isn’t 100% effective in all dogs, but in clinical trials, 75% got good to excellent results. As with all drugs, there are contraindications. Sileo shouldn’t be used in dogs with severe liver, kidney, heart, or lung disease, or if a dog is seriously ill or pregnant. Some dogs may be sensitive to it and will exhibit sedation, a drop in body temperature, and a slowing heart rate. I recommend that dog owners be home to observe their pet’s response the first time they give Sileo. The cost of Sileo depends on the size of your dog, and ranges from $2.50/dose for a toy dog (4.5 lbs. – 12 lbs.) up to $25/dose for a giant breed (196 lbs. – 220 lbs.). Treating dogs in the weight range we see the most (12 lbs. – 86 lbs.) will cost between $5 and $12.50/dose. I’m not convinced that dogs with frequent noise-induced fear should be given this drug. I see patients that are afraid of just about every noise, and for them, there are better options, such as behavior modification and an SSRI (Prozac). But for the pooch with an isolated phobia (just fireworks, for example), time and experience will see whether this new drug can mean a more laid-back Fourth for Fido. 1. Here are some signs that your dog is afraid of loud noises: Pacing, panting, escape behavior, hiding, cowering, sticking to you like glue, loss of appetite, salivation, inappropriate urination or defecation, whining or barking, yawning, and excessive vigilance. Chasing a plastic bag is fun! Bonnie, a muscular golden retriever, limped into the exam room, her head bobbing when her lame foreleg hit the floor. 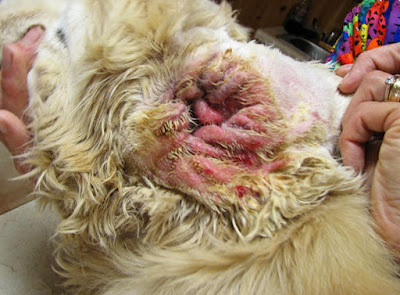 Bonnie’s owner, Sue, explained that the injury was the result of a vigorous session of lure coursing. My quizzical expression brought a crash course on the subject of lure coursing from Sue, an avid dog enthusiast. I was intrigued; I had to observe this madness for myself! I finally got the chance to do that a couple of weekends ago. It was the grand opening of a series of monthly events named AIM (Auss-In-Motion), sponsored by ASRM, the Australian Shepherd Rescue Midwest. It was a beautiful day in Libertyville, where the event was held on five picturesque acres of fenced-in private property. The $5 fee bought your tail-wagging friend two sprints around the course and supported the rescue. A lure course consists of a series of pulleys that are staked to the ground and arranged in a zigzag pattern to simulate the unpredictability of chasing a live animal. A motor-driven cord pulls the “prey,” typically a plastic grocery bag or small pelt of fur, along the course, which is usually 600 to 1,000 yards long. The operator at the AIM event manipulated the lure to make it more enticing for newbies, while veterans needed no persuasion. 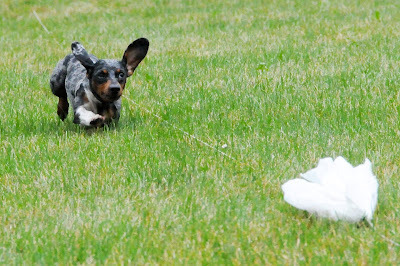 He gave the handler a cue to release the dog, who then chased the bag around the course. 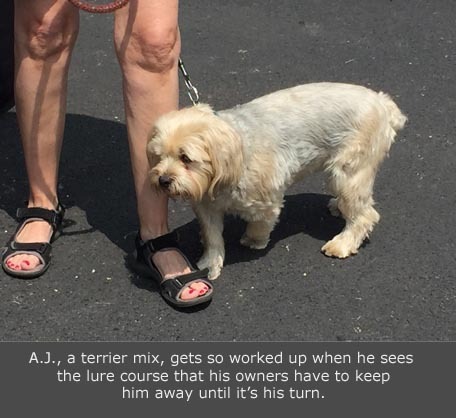 The operator controlled the speed of the lure, so even short-legged dogs could participate. Sighthounds, such as greyhounds, have an innate drive to chase prey, and lure coursing was developed so they could satisfy that urge in a safe environment. In the United States, it started out as a competitive event. Two organizations, the American Sighthound Field Association (ASFA) and the American Kennel Club (AKC), sanction the competitions. The list of qualifying breeds is restricted to sighthounds. But why limit the fun to sighthounds? Could the drive that incites your terrier to chase squirrels and kids on bicycles be diverted to dashing after a plastic bag on a pulley? The answer, it turns out, is yes! At some point, dog lovers realized that many breeds cherish the chase. In 2011, the AKC launched the Coursing Ability Test, a less-intense event open to all dogs registered with the AKC or with AKC Canine Partners. And many similar recreational events, such as Auss-In-Motion, have been born across the country. The preponderance of dogs at the Libertyville event were Australian shepherds, but there were also border collies, golden retrievers, a boxer, a puggle, and other pure and mixed breeds. Others had to be coaxed to give chase. Still others decided that it was just too much work! 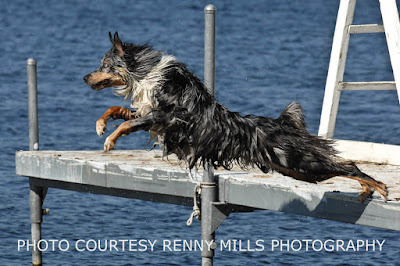 A few were over the top with enthusiasm; this border collie really “killed” it! This activity is not for the physically unfit; every dog was panting heavily after the exertion of the chase -- even a greyhound that ran gracefully and with apparent effortlessness. 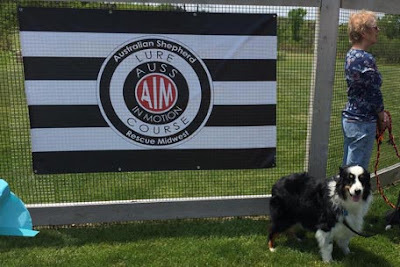 So if you’re interested in trying lure coursing, be aware of your dog’s athletic capability. Extra pounds should be lost, and your buddy should have some prior conditioning, such as daily ball chasing. Because the sharp turns can be tough on joints, waiting until your dog is over a year old is recommended. On the day of the event, make sure you give your dog time to digest her food. That means feeding a smaller amount than normal at least four hours ahead of time, and not for an hour afterward. Take her for a cooling-down walk when she’s done. Offer water when her breathing is back to normal. The AIM event had water available, and there was even a baby pool for a post-run dip. As Sue found out with Bonnie, even fit, athletic dogs can sustain injury from the high speeds and sharp turns of lure coursing. But the minor risk of injury is outweighed by the fun your pooch -- whether a Chihuahua or a borzoi -- will have. If she delights in chasing things, she will love the lure! If you think you’ve got it bad, smelling rotting sack lunches in the break-room fridge or putting up with a co-worker’s fetid breath, try spending a day in a veterinarian’s shoes: Being adorned with various body fluids is all in a day’s work for us. But some things are more odious than others, so for the entertainment of the reader with a morbid curiosity and a strong stomach, I present some of the nastier things seen in veterinary practice. Let those with queasy stomachs be forewarned. But if you stick it out to the end, I’ll let you in on a secret! 1. Abscesses: There’s a distinctive smell to pus, and it’s not pleasant. And as far as the appearance of the stuff that oozes from an abscess, let’s just say that once you’ve seen it, you’ll never think of strawberry yogurt the same way again. 2. Rotten teeth and severe gingivitis: If you open your garbage can on a hot day, that’s the odor of severe periodontal disease. 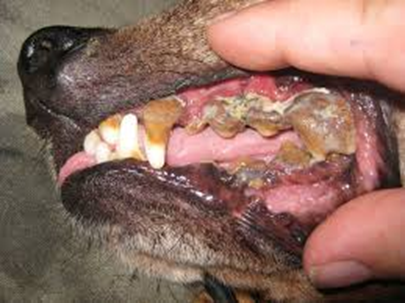 Pus is often visible in the deep pockets under the gums. Sometimes the tartar completely coats the teeth, which makes it impossible for us to know what we’re going to find when we clean them. If the pet owner consents to a dental prophy, it’s not unusual for us to perform more than 15 extractions in a mouth like that. 3. Proptosed eyeball: This is a fancy term for an eyeball that has popped out of its socket. Yes, it looks like something in a horror movie! But how could this possibly happen? Some breeds, such as Lhasa apsos and pugs, have very shallow eye sockets and big eyeballs, which makes it easier for their eyes to proptose. I saw a pug a couple of weeks ago whose eyeball popped out when she sneezed! Needless to say, proptosis is an emergency; the sooner the dog is seen, the better the chance of saving her vision. 4. Intestinal foreign bodies: Cats, but more often dogs, eat strange things. (See this blog post.) If they eat something soft, such as a sock or a dish cloth, the object stews in foul-smelling juice until we surgically extract it from the stomach or intestinal tract. Sometimes we have to pick apart the congealed mass just to be able to identify what it is -- an olfactory assault. 5. Purulent ear infections: Purulent = pus. I can smell one of these when I walk into the exam room. The animal’s ear canal is usually red, crusty, and swollen shut. These poor guys are in severe pain. 6. Maggots: Yes, dogs and cats can get maggots. They might infest a pet that has an open wound and is kept outdoors, but more often we see them when old or infirm pets lie in urine or feces and aren’t kept clean and dry. When the smell of putrifying flesh permeates the room, we know it’s time to play “find the maggots.” I once saw an ancient Lhasa apso with so many maggots that I could actually hear them squeaking. I still have nightmares about that one. Maggots are life-threatening, and that unfortunate little dog had to be euthanized. I promised you a secret, and here it is: As long as there’s no intentional neglect involved (as there was with that dog with the maggots), we vets love this stuff! Yes, it can be offensive, but we’re used to it. We love trading war stories with our colleagues about our unusual and nasty cases -- a sort of gallows humor -- so maybe we’re a bit twisted. But someone has to deal with these cases, and we’re happy to oblige. And we derive a great sense of satisfaction from helping pets that suffer with these afflictions. If you’re lucky enough to have a dog or cat live into old age, you’ve seen her eyes develop a hazy, milky appearance. It may have alarmed you because you were worried that she had cataracts and might become blind. What you’re seeing is a normal age-related change referred to as nuclear sclerosis, lenticular sclerosis, or hardening of the lens. Virtually all dogs and cats over seven years of age have some degree of sclerosis, as do most people over 40. Yes, you read that correctly; it will happen to you, too! In both people and pets, the lens in the eye continues to grow throughout life. There’s nowhere for those extra fibers to go, so the lens becomes thicker and more dense. The difference between seeing through young eyes vs. old eyes may be compared to the difference between looking through a thin piece of glass vs. a thicker chunk of glass. The lens focuses light onto a specific area of the retina, which allows us to see clearly. With sclerosis, light is no longer precisely focused on that central part of the retina, and our vision becomes blurry. And that’s what drives us to go to Walgreens for reading glasses in our early 40s. It’s also the reason most people get surgical lens replacement, or cataract surgery. We need visual acuity to read, drive a car, recognize shapes and colors, and see objects in fine detail. Because dogs and cats don’t need to read the paper, watch TV, or take the car for a spin, the loss of focus isn’t as critical for them. But that’s not to say they don’t experience some loss of vision. Fortunately, it doesn’t seem to be a problem for them in most cases. If I can see the architecture of a pet’s retina through my ophthalmoscope, it’s likely that her vision is pretty good, even if her lens is quite hazy. Often, owners of such pets will tell me the pet has problems seeing only in low light. But sometimes I can barely see the colorful reflection of the retina and can’t visualize the retinal blood vessels.1 Those pets most likely have blurry vision and may have trouble recognizing people and objects by sight. 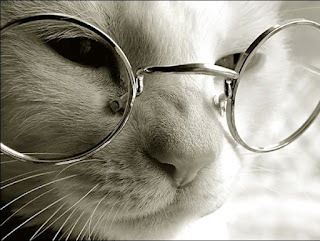 In humans, cataracts are considered to be a form of nuclear sclerosis, but in veterinary medicine, we make a distinction between the two.2 Cataract development can be a significant cause of blindness in dogs and cats, whereas sclerosis causes less severe visual impairment. 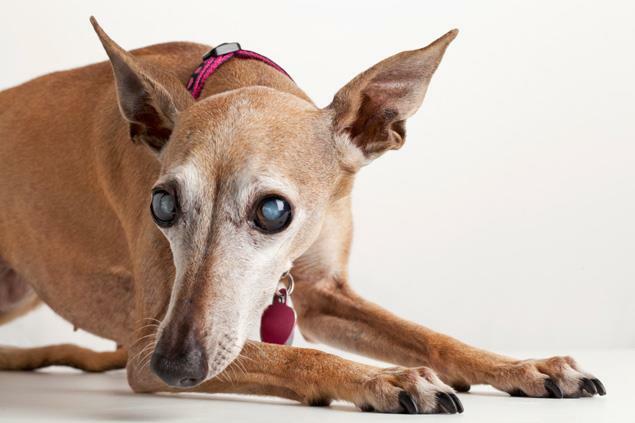 Although sclerosis occurs in aging dogs, cataracts may occur at any age for a variety of reasons (congenital, traumatic, age-related, metabolic, post-inflammatory). Cataracts are corrected by surgery, whereas surgery isn’t done for sclerosis. In fact, in spite of ads for magical nutritional supplements, there’s no treatment for sclerosis that has been scientifically proven to be effective. So rest assured that your senior pet’s milky eyes most likely are not cataracts and probably bother you more than they do her. But don’t forget to turn the light on when she goes down a dark staircase! 1. Dogs have an amazing structure at the back of their eyes called the tapetum. It’s a colorful reflective surface that allows them to see in the dark. Severe sclerosis prevents much light from reaching this reflective surface, so not only does the normally bright tapetum look hazy to me, but also the dog doesn’t get enough light to the back of her eye to allow her to see in low light. 2. We can usually differentiate between cataracts and nuclear sclerosis with a visual inspection of the eyes with a light source. Cataracts can appear as dots, stars, or other shapes and can even have a sparkling appearance. They may start out as a diffuse haze, much like sclerosis, but often progress and become completely opaque. When it comes to visits to an animal hospital, the latest buzzword in the veterinary world is “fear-free.” For dogs, a non-stressful experience is quite attainable. But where cats are concerned, I find that jargon amusing. The occasional easygoing critter aside, it’s disingenuous to claim that a veterinary visit with the typical feline is fear-free. More often, a realistic goal is simply to get your kitty to and from the animal hospital with the least amount of angst for both of you. And I can help with that! According to the American Association of Feline Practitioners, 38% of cat owners say they get stressed just thinking about taking their little buddy to the veterinarian, and 58% report that their cat hates going to the animal hospital. Sadly, that explains the grim statistics that show that dogs are far more likely than cats to get needed veterinary care. To ensure your special feline gets the best preventive care possible for a long, comfortable life, read on. We need to start at the beginning, long before you leave home, and address the two things that scare most cats far more than the exam room and the doctor: the cat carrier and the car ride. 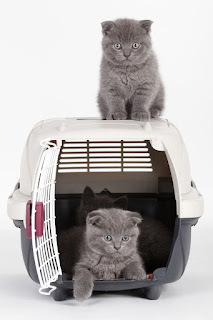 If you don’t have a carrier1 or crate, choose one with a hard plastic shell that includes a door on top, or one with an easily removable top (preferably with latches instead of screws). If you buy a soft carrier, pick one that provides easy access to the cat. It’s much less stressful for your kitty to be lifted out of the top or side of a carrier than to be pulled or dumped out the front. The carrier should be large enough for him to stand, sit, lie down, and turn around in. It’s not difficult to get a cat to like his carrier, but it can take patience. Place it in the room where he spends the most time, but not in a confined space if he’s afraid of the carrier. He needs to be able to approach it at his own comfort level. 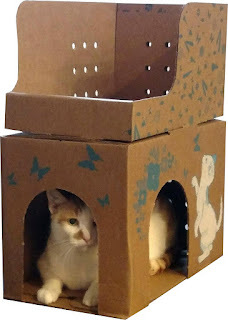 Open all the carrier doors; place some soft, familiar-smelling bedding in it; and put a treat inside. Don’t give him any treats except the ones you put in the carrier. If he doesn’t eat treats, put a favorite toy inside. Then ignore the carrier. Don’t try to entice your cat to go in it. Once you notice that the treats you put there are missing, see if he’ll go into the carrier as you toss treats or a toy inside it. If he doesn’t, try the next technique. You can acclimate your cat to the carrier by placing it a comfortable distance from his food bowl. If he shows fear of the carrier, the bowl is too close. Slowly move the food bowl closer to the carrier, day by day. Again, if he balks at being near it, you’ve moved it too fast. Eventually, you’ll be able to feed him inside the carrier. Once you can do that, close the doors and keep him inside for brief periods of time. When he accepts that, get him used to being carried around the house in it. Now you can place him in the car for short sessions. Eventually you can progress to starting the car, and finally to taking a few mini car trips around the block. On your preliminary excursions, try to figure out where your cat prefers to ride. Some like having their carrier on a seat where they can see you, but some prefer the floor. Others prefer having the carrier covered. Don’t blast loud music on the radio! Try playing some soft, calming music instead. Once you reach the animal hospital, you may want to cover the carrier with a towel or small blanket when you walk in the reception area. That is important if your cat is afraid of strangers and dogs. We have a basket of towels in the waiting area for that purpose. You can also give us a call when you arrive, and we’ll alert you when we’re ready for you. That way, you can walk straight into the exam room and avoid the waiting area altogether. Despite your best efforts, your cat might still be nervous at our office. It’s helpful to spray or wipe his carrier with a calming pheromone, such as Feliway, at least 15 minutes before you put him in it. And feel free to ask us for a sedative. We have a powder, which we provide at no charge, that can be mixed into food a couple of hours before your appointment. There’s no reason why a healthy kitty should have to suffer with fear when we can safely use calming agents to take the edge off his anxiety. Remember: You might be able to outwit your cat and stuff him unwillingly into his carrier, claws slashing, but we can’t examine a fractious, resistant cat very well. So get the most bang for your veterinary buck, and take the time to prepare your cat for his next visit. 1. 1 This isn’t an article about carrier safety, but if you’re interested in that, click here. Sadly, almost all pet crates failed accident simulations done by the Center for Pet Safety. It seems that placing the crate or carrier on the floor behind the front seats was actually safer than securing it with a seatbelt. Hard-shelled plastic crates are safer than soft carriers in the event of a car accident. I had just finished suturing the incision on the Shih Tzu’s right hip. Now came the tactical planning: How could I keep Snookie from tearing out her stitches and mutilating the surgical site? By far the most common post-op solution to prevent dogs or cats from destroying sutures is the Elizabethan collar, or E-collar. I’ve heard many names for this much-hated apparatus: cone of shame, lampshade, satellite dish, and #@*&! torture device! I don’t blame our cone-phobic clients. When my last dog needed an E-collar after a surgery, he banged against woodwork, tripped going up the stairs, scooped up mulch from the garden, and delivered countless sharp assaults to my poor, bruised shins (even after I finally resorted to wearing blue jeans in the hot summer weather). I’ve heard many a tale of E-collar disasters. There are dogs who make it their mission to knock every knick-knack off shelves and tables, spend countless hours rolling and pawing at the cone, or dramatically howl in mental agony until their spent owners relent and take it off. But the alternatives are worse: torn-out sutures that need to be redone, self-induced painful hot spots from itching or licking, or bandages that get shredded and eaten, possibly causing an intestinal obstruction. 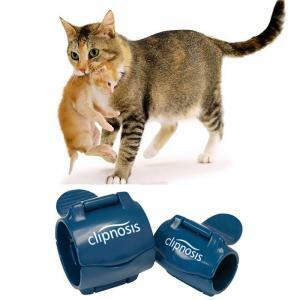 I can’t say the dreaded E-collar is a thing of the past, but alternative products that prevent self-mutilation in pets have become a cottage industry. Go to any veterinary convention hall, and you’ll find vendors hawking innovative items that often originated at the founder’s home sewing machine. Sometimes surgery is a last-minute affair, or an angry, infected hot spot must be protected immediately; you won’t have time to surf the Internet for the perfect protective cover-up or contraption. 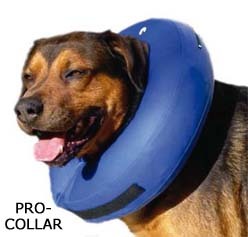 That’s why we have a respectable inventory of E-collars and E-collar alternatives. But if your pet has upcoming elective surgery and you want to forgo the cone, with a little forethought you can choose the perfect substitute from our animal hospital, a pet store, or online. Here are my picks of the best ones, including the ones we have on hand. Prices may vary widely, so do your due diligence. 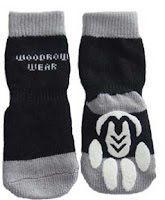 They’re made of a breathable, stretchy cotton/lycra fabric, which provides good freedom of movement. 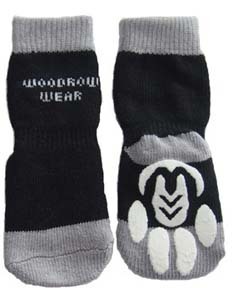 They come in two styles, full-body or front-only coverage, with optional add-on front and hind leg sleeves. For dogs, you’ll need to unsnap and fold up the bottom half when they go outside. The shirts can remain fastened for the majority of cats when they use the litter box. The availability of many sizes makes these our go-to post-surgical garment. These are similar to Medical Pet Shirts, although they don’t offer a hind leg sleeve or a front-only option. Both companies have very similar front leg sleeves. Most cats can use the litter box without having to remove the cover-up, an essential feature. 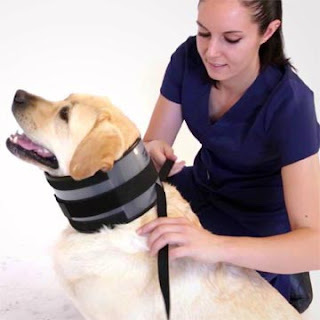 As with Medical Pet Shirts, the rear side of the suit should be rolled up when you walk your dog. 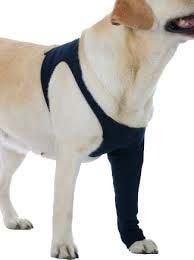 These are compression garments made for veterinary use. They come in a variety of front and rear sizes, as well as male and female versions. Despite all the options, we find that some of our patients fall between sizes, or that the large openings for the legs sometimes don’t cover the incision. But with a top Velcro closure, they’re fairly easy to take on and off. Very nice for when compression of an incision or wound is desirable. 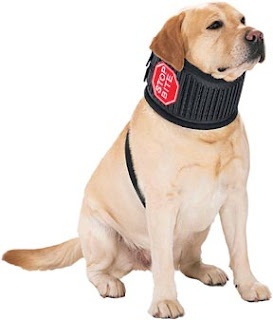 This is similar to a neck brace and may not appeal to some pet owners, but it allows unimpeded peripheral vision and seems to be fairly comfortable. It’s made of flexible plastic and foam, and it’s machine washable. The harness strap helps keep it on. We find that pets can still reach their lower legs and tail with these, and it seems that more than a few dogs fall in between the available sizes. 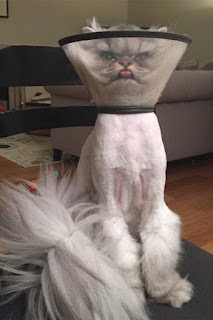 Although Bite Not Collars are also made to fit cats, there are better alternatives out there. Think of the Bite Not Collar – on steroids! It uses the same principle, but these are made of tougher plastic and have adjustable snap buckles, which we prefer to the Velcro on the Bite Nots. The limited number of sizes can make a perfect fit difficult. This inflatable doughnut has a sturdy canvas outer layer and an inflatable inner tube. There are Velcro straps on the outside, and fabric loops on the inside that attach to your pet’s collar. Most clients like this product. My only beef is that it can occasionally deflate due to faulty seams, especially with destructive dogs. Our clients who have tried these products really like them. They allow dogs to move without getting stuck (great for crates and doggy doors), and the Velcro fastener allows them to fit in a snug manner so they don’t wiggle. They even come tinted for UV ray protection. They can be shortened along stamped grooves at the rim to better fit your dog’s snout length, a very nice feature. Best of all, they don’t cover the ears, which is convenient when ear medications are necessary and which also allows your dog to hear better. And they stay on greyhounds, a breed whose tapering neck and head make keeping E-collars from slipping off a challenge. 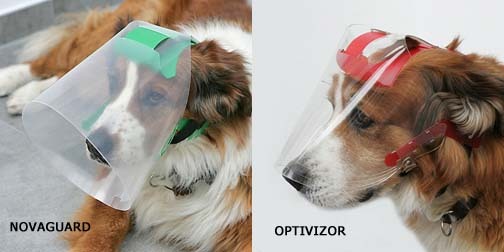 The Optivizor is a smaller version of the Novaguard and is appropriate for use after eye or facial surgery, or for protecting the eyes of blind dogs. It conveniently has a version for dogs with short snouts, such as pugs and bulldogs, and one for long-nosed breeds, such as greyhounds. 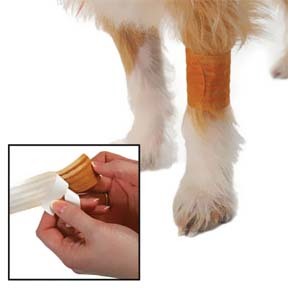 We originally stocked these to help dogs attain good footing on hard floors, but they’re also useful after foot surgery. They have reinforced toes and are very durable. Some dogs won’t accept having anything on their feet, but most of our canine patients seem to find them comfortable. They can be worn outdoors on dry ground. These soft cotton cover-ups come in a variety of patterns, and in step-in and pullover versions. They are also available in long and short sleeves. There’s a built-in “potty cover” for quick and convenient trips outside. Nicely done! We usually use these on leg bandages. They’re coated with all-natural ingredients (cayenne pepper, oregano, lemon powder, and clove oil) that taste and smell nasty. They work pretty well, but they don’t always stick as well as we would like them to. Although the above-mentioned products are commercially available, our creative clients have come up with many of their own post-surgical garments. 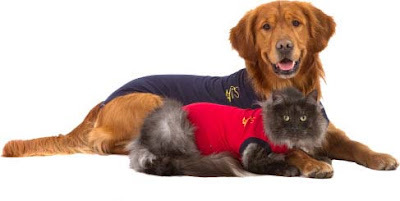 Thundershirts and doggie shirts can be repurposed to protect healing skin. 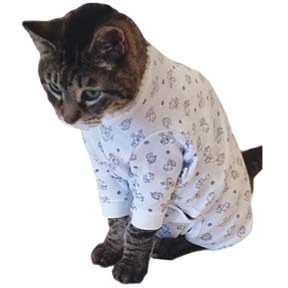 Human T-shirts and infant onesies can be altered with strategically placed openings to suit your pet. As for Snookie, the Shih Tzu I mentioned with the incision on her hip? Her owner bought her a pair of sparkly infant tights; a couple of quick snips with scissors to accommodate her tail and allow her to urinate was all it took to make a chic custom garment!